Drones are the latest gadget for hobbyists and professionals alike. While many people simply see them as a fun, new kind of remote-controlled device that they can fly around, people in the entertainment industry can easily use drones to take their photography and filmmaking projects to the next level. Professional-grade drones can be expensive, making drone insurance from a reputable entertainment insurance agency essential, but the investment can be worth the stunning images that you can create as a result. Drones have a wide range of applications in the film, television, and photography industries. They are currently being used for nearly every kind of filmed project, from commercials and shows to feature films and documentaries. Thanks to increasingly advanced technology, drones have the potential to become even more ubiquitous in the industry than they are today. By attaching cameras to drones, producers of all kinds now have more options regarding the types of images they can show. Drones can be used to get film or photographs from angles that would otherwise be difficult to achieve, such as shots from high above or inside small areas that a person cannot navigate. These new angles are providing viewers with more interesting forms of media and inspiring artists to create previously unthinkable projects. Drones can also help artists quickly survey a large area in order to find the best locations for filming and photographing, saving significant amounts of both time and money for their creations. There are several key benefits to using drones, from cost and time savings to increased safety for film crews. A camera drone and operating crew can cost up to $20,000 less per day than a helicopter and crew, the traditional method of capturing sweeping aerial shots. They are also much safer than helicopters because if any problem were to arise, the only damage would likely be to the drone itself instead of to the operators of the device. Drones are also far more financially accessible to amateur filmmakers and photographers. As a result, more people are able to create stunning works of art that they may not have otherwise been able to accomplish with their limited resources. This newfound accessibility can drastically alter the industry, as it would allow more people to create and distribute professional-quality films and photos for viewers’ consideration. Drones provide amateur and professional filmmakers alike with a wider variety of angles, shots, and images than any other type of camera before. They are lightweight and easy to operate, and filmmakers of all levels are therefore able to use a drone in their work. Artists are limited only by the range and size of their drones, making it possible to capture images that a human camera operator would never be able to make. 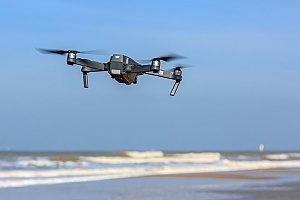 These devices can also speed up production times, as it may be quicker to simply fly a drone with the appropriate camera attached to film a scene or take a photo than to organize the logistics of using a human camera operator. Scenes can therefore be shot more quickly, using one drone camera instead of several strategically-located cameras throughout the scene. Shorter production times not only save time and money for artists, it may also enable them to spend their time creating more films and photos rather than on planning each project. While only 10% of all productions use drones for filming today, interest in the technology is much more widespread, and it is likely that drones will eventually become an integral part of film sets and photo shoots. Many producers are responding to the interest by creating drones specifically designed to provide artists with the tools they need to create new images in their work. Due to their popularity, drone manufacturers are now including a variety of advanced features in their machines. Some now use computer-assisted focus technology to help them set up shots, while others have smart battery management features. 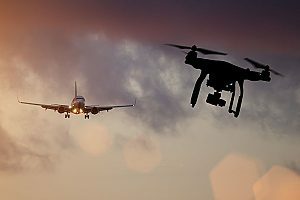 While a number of drones have built-in cameras, others contain harnesses and other attachment methods to allow photographers and filmmakers to attach the cameras of their choice to their drones for more flexibility. Many drones also offer live streaming to a computer or other device to allow directors to view the footage as it is being taken and make adjustments as necessary. These features provide creators with new opportunities in filmmaking and photography. Drones themselves may likely take center stage as a form of entertainment without the need for extra cameras. Devices with multi-colored lights attached have featured heavily in Super Bowl halftime shows and Olympic opening ceremonies alike to great success. Light displays may soon replace expensive fireworks shows, paving the way for them to be used in films as an alternative to other forms of lighting and pyrotechnics. As drones become cheaper and easier to operate, more and more filmmakers and photographers are likely to begin using them in their productions. With an extensive array of new features for drone manufacturers to include in their devices, using drones in artistic productions can become an even more attractive opportunity for creators. Drone insurance can protect your new investment — and you — from a variety of problems. If your drone is damaged due to improper handling or an accident, such as being caught in a tree or damaged by wildlife, an insurance policy can help you repair or replace the drone. 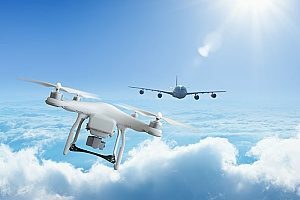 Insurance can also help you pay the medical bills of employees or third parties who are injured because of the drone, as well as any legal fees that may result from the situation. Drone insurance can also cover any payments necessary to help cover the damage of property, including cars and buildings, that result from a drone-related accident. Purchasing drone insurance not only protects you investment in your new technology, it also protects your company and the people who operate and otherwise interact with the drone from financial distress.